Tropical storm Isaac passed through the warm waters of the Florida Straits to slam the Keys with intense winds and heavy rain. In Haiti, at least seven were killed. NBC's Al Roker reports. Updated at 11:27 p.m. ET: As Isaac lashed south Florida on Sunday, the tropical storm threatened to make landfall later this week as a hurricane in New Orleans on the seventh anniversary of Hurricane Katrina’s near destruction of that historic city. Although the worst seems to have passed in Florida – a relief to Republicans planning their national convention – officials in Key West ordered visitors and residents to remain indoors as the storm moved through the island chain. As of 11 p.m. ET, the storm had maximum sustained winds of 65 miles per hour, was about 75 miles west, southwest of Key West, moving west, northwest at 14 miles per hour, the National Hurricane Center in Miami, Fla. said. Isaac caused weekend havoc in Cuba, where it downed trees and power lines. Before that, Isaac was blamed for seven deaths in Haiti. Forecasters warned that Isaac could be upgraded to a Category 2 hurricane – capable of sustained winds of 96-100 mph – as it hits the northern Gulf Coast somewhere between Florida and Louisiana later this week. The governors of Mississippi and Louisiana declared a state of emergency as officials prepared for Isaac. Louisiana Gov. Bobby Jindal urged residents in low-lying areas of several southeastern parishes to voluntarily leave ahead of the storm. He said mandatory evacuations would likely be ordered on Monday. The governor also activated 4,000 National Guard troops and informed other states that Louisiana might need assistance if hit by Isaac. "We’re all going to err on the side of being overprepared," Jindal said. He added that he may skip his speaking engagement at the Republican National Convention in Tampa, Fla., this week if his state is still threatened by the storm. In the city of New Orleans, which was ravaged by Hurricane Katrina seven years ago, Mayor Mitch Landrieu also declared a state of emergency. "I'll remind everybody that we thought Katrina would be a wind and rain event," Landrieu said. New Orleans Mayor Mitch Landrieu declared a state of emergency in his city, warning residents to be prepared as the storm hurled toward hurricane status. NBC's Gabe Gutierrez reports. "Residents should be frightened because we have issued a State of Emergency," Mississippi Gov. Bryant said. "However, I urge individuals and families to finalize their personal preparedness efforts. Review your family communication plan, make sure your emergency supply kit is fully stocked and know where you will go if you need to evacuate." The National Hurricane Center on Sunday evening discontinued a hurricane warning for the Florida Keys and west coast of Florida, but issued a hurricane warning hurricane for the northern Gulf of Mexico coast from the New Orleans area to the Florida Panhandle. In South Florida, three people were killed in two separate crashes due to wet roads, reported NBC News affiliate NBCMiami.com. The first crash involved a head-on collision, which killed both drivers, and in the second, the car plunged into a canal and the driver drowned, officials said. 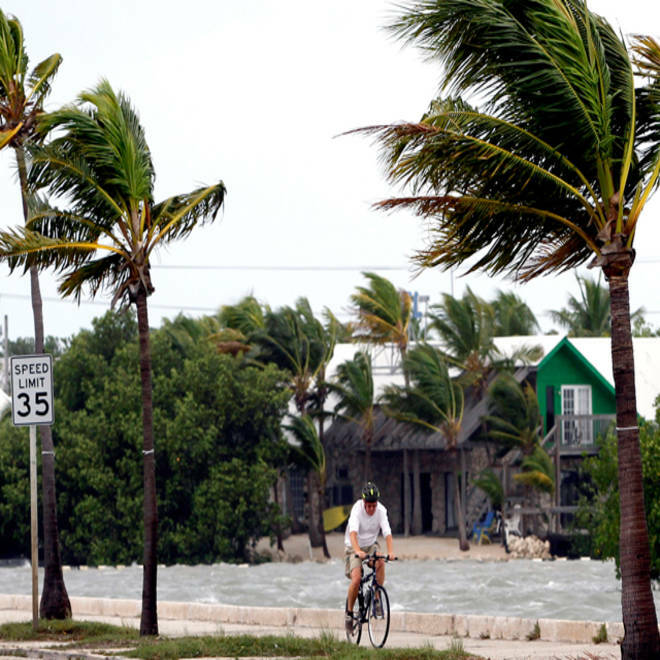 Some minor flooding and power outages were reported in the Florida Keys but with the worst seemingly over, South Florida officials were relieved as Isaac shifted west. "We prepared for the worst and for us it's a relief," Miami-Dade Mayor Carlos Gimenez said, according to NBCMiami.com. This storm will encounter a different New Orleans -- many homeless because of Hurricane Katrina. The storm will also test new gates and levees. NBC's Brian Williams reports. Dr. Rick Knabb, director of the National Hurricane Center, said forecast models “can drive us nuts sometimes” but they play an important role for guidance. “It’s still very uncertain where the center of Isaac will come ashore in its final landfall in the northern Gulf,” Knabb told the Weather Channel on Sunday, “and that can make all the difference as to who gets the strongest winds, who gets the strongest storm surge. “Gradually, we’re seeing (Isaac’s) inner core develop. We’re certain it’s going to be a hurricane in the Gulf of Mexico,” Knabb said. The Republican Party said it would recess its national convention in Tampa for a day out of safety concerns as the storm bore down. Republicans, who will formally nominate Mitt Romney as their presidential candidate for the November election, will briefly convene their four-day meeting on Monday, then recess until Tuesday. “When she storm passes and the sun comes out it’s going to be great to be in Tampa,” Tampa Mayor Bob Buckhorn said. Isaac's path – whether west toward the Florida Panhandle or east toward New Orleans – is disputed by European and U.S. weather forecasting models. The Weather Channel's Bryan Norcross has more. Airlines are preparing for Isaac’s impact on Florida by waiving fees for changes and refunds for flights into and out of south Florida. Additionally, airlines on Sunday canceled most of south Florida operations. Key West airports were closing Sunday night and most operations in and out of Miami and Fort Lauderdale were canceled until noon Monday, according to FlightAware.com. Airlines are not expecting long-term impact in Florida from the storm and should be operating normally by late Monday once airplanes, crew and staff are back in position. More than 740 flights to, from and within the United States were canceled Sunday in preparation for Isaac, with the bulk of the cancellations at Miami and Fort Lauderdale. Meanwhile, the Sunday night performance of classic rock legends Lynyrd Skynyrd at Tampa’s American Action Network Pavilion at Liberty Plaza was canceled over safety concerns. Key West locals followed time-worn storm preparedness rituals while awaiting the storm. On Saturday, a steady line of cars moved north along the Overseas Highway, the only road linking the Florida Keys. Residents boarded up windows, laid down sandbags and shuttered businesses ahead of the approaching storm. Even Duval Street, Key West's storied main drag, was subdued for a weekend, though not enough to stop music from playing or drinks from being poured. Tropical Storm Isaac rakes the Dominican Republic, Haiti and Cuba as it makes its way toward Florida. "We'll just catch every place that's open," said Ted Lamarche, a 48-year-old pizzeria owner visiting Key West to celebrate his anniversary with his wife, Deanna. They walked along on Duval Street, where a smattering of people still wandered even as many storefronts were boarded up and tourists sported ponchos and yellow slickers. "Category None!" one man shouted in a show of optimism. The Keys were bracing for storm surges of up to four feet, strong winds and the possibility of tornadoes. The island chain's two airports closed Saturday night, and volunteers and some residents began filing into shelters. The Associated Press, Reuters and NBC's Isolde Raftery contributed to this report.